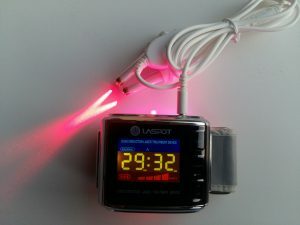 The best ever birthday present idea for your family and friends is a Cold or Low-Level Laser Therapy (LLLT) Watch. 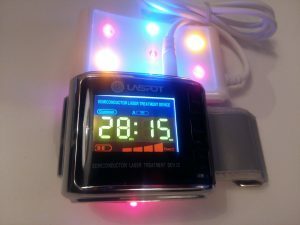 LLLT watch is a safe, painless, sterile, non-invasive, drug-free treatment and prevention devise that is used to treat a variety of pain syndromes, injuries, wounds, neurological conditions, insomnia, tinnitus, rhinitis, hay fever and recently to lower blood pressure, cholesterol, triglycerides, glucose and to improve blood viscosity. Unlike hot lasers, which are used for surgical purposes, cold lasers are strictly used only for healing purposes. 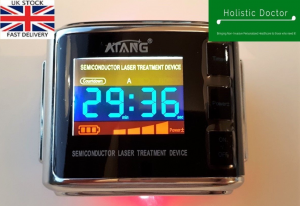 LLLT technology is a form of alternative medicine that applies low-level (low-power) lasers or/and light-emitting diodes (LEDs) to the surface or orifices of the body. LLLT is effective, in relieving short-term pain for rheumatoid arthritis, osteoarthritis, acute and chronic neck pain, tendinopathy, and chronic joint disorders. American College of Physicians guidelines includes a “strong recommendation” for LLLT as a non-invasive treatment for acute, subacute & chronic low back pain (2017). LLLT is recommended for the chronic non-specific low back pain in the short term (2016). A systematic review of surgical and conservative interventions for the frozen shoulder found “strong evidence” for LLLT (2010). The BMJ clinical evidence recommendations for tennis elbow include LLLT as well (2011). LLLT applied for 4 weeks improved symptoms in patients with chronic rhinosinusitis (2013). The LLLT resulted in enhanced healing as measured by wound contraction (2004). LLLT is a painless and safe therapy that requires a minimal time commitment. It decreases inflammation, increases local blood flow and stimulates hair growth. It is FDA approved, and it has been scientifically proven to be both safe and highly effective for hair restoration. Price to rent for 1 month is £99 and if you like it, you can pay rest of £100 on your second visit. Also, you can buy it from eBay by clicking here. Red laser (650 nm) activates metabolism by lowering blood pressure and improving blood flow. Laser light activates different enzymes and decomposes redundant fat in the bloodstream. It increases the oxygen amount in the blood, boosts metabolism and enhances the process of lipid peroxidation to reduce cholesterol in the vessels. Blue LED light stimulates the first complex of the respiratory chain (NADH dehydrogenase). Instead of just utilizing the red laser, the latest generation now also emits blue light LED in order to activate regeneration processes by stimulating the different parts of the mitochondrial respiratory chain. It has anti-inflammatory effects, enhances NO production and activates telomerase (anti-ageing effect). By increasing the activity of fibroblasts blue light optimizes wound healing and improves the oxygen utilization in the tissue. Due to its anti-inflammatory effects, the laser pad can be used very successfully in dermatology. Yellow LED light promotes serotonin and vitamin D metabolism. Serotonin is our “happiness hormone” and is involved in the regulation of numerous body processes. When binding to certain receptors, it affects the contraction of blood vessels in the cardiovascular system. It also regulates our intestinal movements. 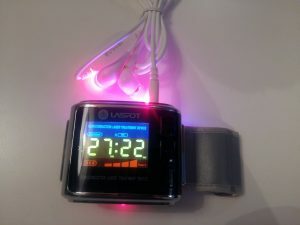 This Laser Watch has shown to increase the serotonin level in the blood and thus lightens the mood and stimulates vitality. Yellow light stimulates the mitochondrial respiratory chain at complex III (cytochrome) and acts strongly detoxifying and anti-depressive. Tinnitus involves the annoying sensation of hearing sound when no external sound is present. Tinnitus symptoms include these types of phantom noises in your ears: Ringing / Buzzing / Roaring / Clicking / Hissing. The phantom noise may vary in pitch from a low roar to a high squeal, and you may hear it in one or both ears. In some cases, the sound can be so loud it can interfere with your ability to concentrate or hear actual sound. Tinnitus may be present all the time, or it may come and go. Through the microscope, we can observe the red cells activated. A headache, dizziness, tinnitus, chest tightness, shortness of breath, palpitations, drowsiness, insomnia, numbness, memory loss and other symptoms change or disappear. User tests changes in blood flow, blood tests, blood viscosity, cholesterol, triglyceride, low-density lipoprotein, or other indicators fall back to normal. Effectively improve and treat some diabetic, especially type two diabetic sufferers. Effectively balance their pancreas function. Long-term using will prevent cardiovascular and cerebrovascular diseases, such as cerebral thrombosis, stroke and sudden death. Firstly, wear SLTD only on the left wrist only. The device’s back part correspond with the radial and ulnar arteries. If there is a lot of dirt in your nasal cavity laser probe or ear cavity laser probe please clean before an application. When using nasal cavity laser probe, stick the nasal cavity head into your nose for 2-3 cm only and clamp the nasal septum. Method of using ear cavity laser probes is the same as wearing common earphones. Press on/off key for 2-3 seconds to turn on the device. You will see the LCD screen is on. Choose treatment time and power (we recommend using maximum power). Insert the nasal or ear or pain relief pad probes line into the earphone socket near the charging socket (both must face your palm). Press on/off key one second to start the treatment (notice: long press of the on/off key will shut down SLTD). You will see the laser light coming out from the probes and actual SLTD. After the treatment is finished, long press on/off key will shut down SLTD. Store it and probes in a safe place after the cleaning (gently wipe with a dry tissue). Only one probe will work each time, nasal cavity laser probe, ear cavity laser probe and laser pain relief pad can’t work together. 1. How to wear the instrument correctly? Reply: Wear the main machine on the inner side of the left wrist, and keep the key surface of the main machine parallel to the first cross grain. 2. How often should the instrument be used every day? Reply: As for general users, two times each day, 30 minutes for each time, 10-15 days for one treatment course, 5-7 days intervals for each treatment course. During the treatment, drink more, eat more vegetables but less greasy and fried food. 3. Why does the instrument irradiate the radial artery? Reply: Firstly, the position of the radial artery is more superficial compared with other parts of the body. Secondly, the radial artery is closer to the heart and blood flow here is larger. Blood goes through the radial artery at per eight minutes. Thirdly, the radial artery is easy to touch and locate, which runs along the vein, so laser energy can be easily absorbed by blood cells to ensure good effect. 4. What is the warranty for this device? Reply: Manufacturer provides one year warranty from the time you purchase your device. 5. Is this product approved? Reply: This product is approved by TUV 0197, CE 0197, ISO 13485, ISO 9001, CFDA.